Multiple cameras can be connected to the home automation system this way. Of course it is always possible to view camera images manually through the software. As from Home center 3.0 this is available on all home center clients: Windows client, iPad, iPhone and the web interface. Also, as from Home center 3.0 you can e-mail camera snapshots based on triggers. The modules are automatically recognized, installed and integrated in Home center. This way you don't need any special knowledge about networking. 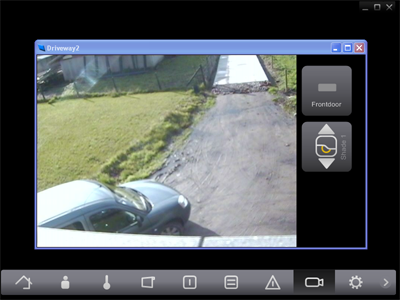 In version 3.0.0.50 we added a great integration which goes beyond showing live camera feed in Home center. It is now possible to operate the in- and outputs of the 2N intercom through Home center. When card 1 is read, open the gate and turn on the light of the drive way and garage 1. When card 2 is used, open the gate and turn on the light of the drive way and garage 2.
you can also open the gate with a press of a button connected to your home automation system or from one of the home center clients. The basic license of the Home center server does not contain camera integration. How to extend your license? You already have a camera? All documents and help are available on de VMBHIS modules help and download page and here online.